Sausage is known to be the oldest and most enduring form of processed meat. In some respects, it may even be considered the world's very first "convenience food." The history of sausage production parallels the recorded history of man and civilization. In fact, for as long as man has been carnivorous, the intestinal tract of meat animals has been used for sausage casings - not to mention a variety of other uses as well. A large variety of sausage is produced world-wide using the processed intestines of pigs, sheep, goats and cattle (and sometimes horses). It is often assumed that sausages were invented by the Sumerians in the region that is Iraq today, around 4000 BC. Reference to a cooked meat product stuffed in a goat stomach like a sausage was known in Babylon and described as a recipe in the world's oldest cook book 3750 years ago (Yale Babylonian collection, New Haven Connecticut, USA). The Chinese sausage Lachang, which consists of goat and lamb meat, was first mentioned in 589 BC. The Greek poet Homer mentioned a kind of blood sausage in his Odyssey (book 20, poem 25); Epicharmus (ca. 550 BC ? ca. 460 BC) wrote a comedy entitled "The Sausage". 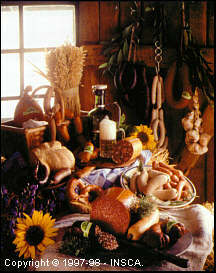 Numerous books report that sausages were already popular among the ancient Greeks and Romans. It's only during the last thousand years, however, that Sausage Making has come into its own as a venerable and highly developed craft. The practitioners of this trade have fostered a rich tradition - at once sophisticated and yet personal. In many cases, families handed down their particular sausage making art over several generations and across dozens of nations, with each "wurstmacher" contributing his taste and heritage to the art. Of course, the art was also influenced by the demand of the marketplace and by the availability of the various ingredients which went into the sausage. The twentieth century brought on the Industrial Revolution - exploding onto the scene with new technology - and adding billions to the world's population. This "one-two punch" generated a need for mass production in virtually all industry segments... especially food! At first, the goals of mass production were primarily "quality" and "speed." But gradually, "quality" struggled toward the forefront of this new technology. The meat processing industry faced its own inherent challenges in slaughter, processing, and food safety. "Efficiency" and "quality" became the norm for those processors who rose to the challenge and managed to withstand the test of time. Sausage making has now evolved into a highly specialized business, with processors ranging in size from independent "mom & pop" shops producing one-of-a-kind gourmet sausages, to multi-million dollar "mega-processors" producing millions of pounds of product each and every week. Today there are numerous types of sausage casings including: Natural and artificial such as Collagen, Cellulose and Plastic. Collagen, Cellulose and Plastic casings are relative newcomers to the artificial field, mainly born out of market demand during the technological maelstrom of the early twentieth century. Much information and instruction about these man-made products is available through the major manufacturers of these casings and it is not our place to delve into them here. As for Natural Sausage Casings, however, surprisingly little qualitative or quantitative information is readily available to processors about these products. INSCA is striving to fill this information gap. The world-wide membership of INSCA generally shares the opinion that all too often, higher quality sausage which should be made using Natural Casings is passed up by processors who are planning production for the wrong reasons - namely, lack of information. Recent technology has all but eliminated the difficulties and significantly increased the profitability of producing Natural Casing sausage. The challenge then, is to make this knowledge more freely available to decision makers of meat processing enterprises. This information is also available in the form of a brochure and is available free to everyone. Our goal is to encourage the production of the highest quality sausage in the most practical and profitable way. This online manual is intended to serve as a guide for sausage makers, deli managers and students of sausage making. This information is provided in the charts at the beginning of the "Natural Casing Products" section. Using these charts, you can learn which casing to buy for a particular sausage, what the optimum quality should be for the job, and very importantly, how much you should buy. In "Handling Casings" you'll find information on buying casings and how to make the most of them through proper storage, handling and processing. The section called "Drying & Moisturizing" is a brief synopsis about the smoking process. This subject is far too technical to be treaded in-depth in the short space provided here, but the overview will at least enable you to recognize some potential concerns and, hopefully, encourage you to further study. Finally, "Making Sausage" provides you with an introductory, step-by-step guide to beginning actual "wurstmaking." This online manual is designed to serve as a general reference for selecting, buying, handling and understanding Natural Casings. Many good recipes are available from a variety of excellent sources, among whom are sausage makers, trade publications, industry associations, cookbooks, etc. In fact, INSCA provides many excelent recipes within this site. We hope you find this information beneficial. Long before man learned to write, he was making and eating sausage. The first cookbook writer provided sausage recipes in 228 A.D. - making sausage in NATURAL CASINGS one of the first convenience foods. With today's interest in ethnic foods, quality sausages in NATURAL CASINGS continue to provide infinite variety - a culinary tapestry of world cultures. Some of the most famous sausages were named after their places of origin, such as Frankfurt; Vienna; Genoa; and Salamis. Today, we can simply walk into a supermarket and have a choice of almost 200 kinds of sausages, each in its own special appeal. Consider all the cuisines of the world which begin with sausage and you approach culinary infinity. What's more, as you sample the various kinds of sausage in different recipes, you find yourself tasting representative foods of the world.